Glucocorticoids (GCs) are steroid hormones made in our adrenal glands. They bind to cell receptors. 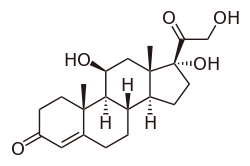 Glucocorticoids regulate glucose metabolism. GCs are part of the feedback system for the immune system. They do things like reducing inflammation. They stimulate the creation of glucose from non-carbohydrate carbons, such as proteins. They are important in foetal development, promoting the maturing of the lungs, and are essential for brain development. This page was last changed on 30 April 2018, at 09:56.